Nipping into Boots can be deadly for me, especially when they have offers on. They’ve got a few brands offering free gifts when you spend a certain amount at the moment so obviously I had to make the most of that offer! I chose to go for L’Oreal one because I had a couple of products I wanted from the brand, and their gift was the one that caught my eye (and purse) the most. You had to spend £14.99 on L’Oreal to get the free gift which was easy for me being the makeup lover I am. The first thing I picked up was this fixing spray which has only recently come to the UK. I’m a huge fan of fixing sprays and I find them a vital part of my makeup routine, whether it’s before foundation to add moisture to the skin, or after I’ve finished to remove that powdered look and just make my makeup melt into my skin for a more natural appearance. When it comes to drugstore fixing sprays, there really isn’t that many options so I’m glad to see this one now available! The next item I bought was this concealer which I’ve seen mentioned by a couple of bloggers recently so I decided it was finally time I tried it – plus that rose gold packaging is everything! This concealer is one of those highlighting twist to dispense types, think MAC Prep+Prime Highlighting pen on a budget. I went for the shade 2 medium even though I have very light (NW15) skin, I found this one to be lighter and more pink toned than shade 1 when I swatched them. I can’t wait to try this and I’ll be sure to review once I’ve started using it. Now onto the best part… the freebies! This set has a very festive with an edgy vibe to it, taking green but adding a darker feel to it. It contains 4 full size products, but after having a look on the Boots website I can’t find any of the products sold individually in these shades so I’m guessing they’re limited edition or old releases they’re trying to get rid of, either way I’m happy considering I haven’t actually paid any money for it. I like that L’Oreal went green over red with this set as I’m just not keen on the colour red, hence why I chose this over the Bourjois gift with purchase. I’m not usually one for green eyeshadows, but this little quad contains 3 shades of wearable greens and a yellow gold on the end. I did swatch them dry on the back of my hand (forgot to take a photo..oops!) and the pigmentation is okay but works better with a damp brush. I can’t wait to have a play around with this palette and create a look with the festive friendly green shades. This nail polish really caught my eye, it’s a really pretty navy blue/green duochrome with subtle shimmer which I absolutely love! Add shimmer to a product and I become a magpie and have to own it asap. I’m looking forward to giving this polish a try as I haven’t tried many from L’Oreal before. I always used to swear my L’Oreal mascaras before I went on to try other brands, so it’s been a while since I’ve used one from them and I’m looking forward to giving this a try. Admittedly this wand does scare me a bit, it’s on the larger side which isn’t the best for my horrendously stubby little lashes but you never know till you try, this could become my new holy grail. This was the product I bought the set for, I’m a big fan of L’Oreal eyeliners so this was the selling point of the gift set for me. This liner has the smallest tip I’ve seen on a liner before, so this is going to great for creating small detailed look and for drawing a little point on my inner corner – YAAAS. So that’s everything I got from L’Oreal, I may have then made a sneaky trip to the Dior counter and bought the Airflash foundation on my way out…oops! I’ll let you guys now if it’s worth the price once I’ve given it a few tries, hopefully I’ll love it *crosses fingers*. 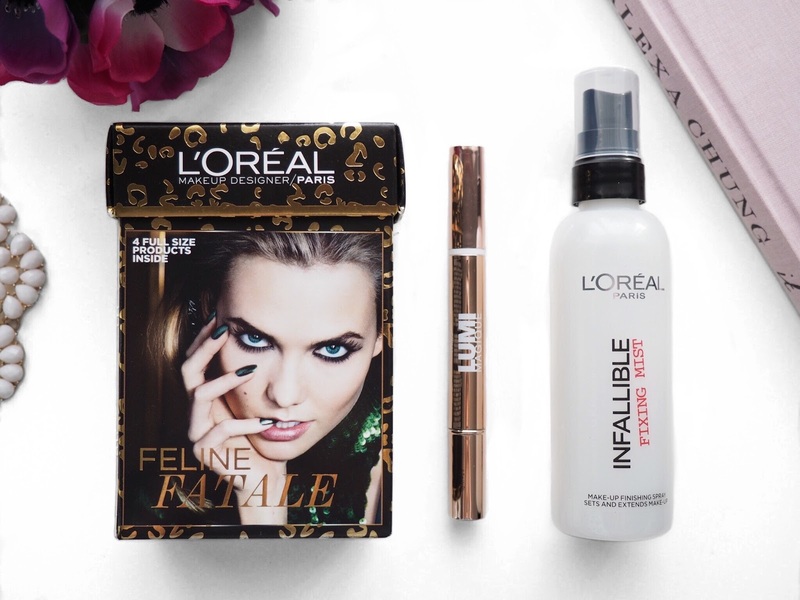 What’s your opinion on L’Oreal? Have you tried this set?